Petra Molnar is a lawyer and researcher with the International Human Rights Project, and is currently completing her LLM in International Law at Cambridge. This October, Julie Lowenstein and Solomon McKenzie sat down to chat with her about her career in International Human Rights Law and her tips and tricks for students interested in the field. Advocacy in Ottawa with Cynthia Khoo, Citizen Lab, September 2018. Credit: Petra Molnar. How much time do you have? I took a circuitous route. I never planned to be a lawyer. I started next door at the Music Faculty as a classical flutist. But I always felt that there was not enough of a social justice focus in music and I ended up switching into Social Anthropology. After my studies, I took a job as a settlement worker at a community agency, working with child soldiers and recently arrived refugees. This role opened my eyes to a new area of work, because I felt an immediate connection there as a migrant from a low income family. I ended up getting a Master’s in Anthropology, and continued to work as a settlement worker. I was then going to do a PhD in England but my funding was taken away, and I had a bit of an existential crisis. I was asking myself if a super theoretical degree was actually the right way forward, and I considered law seriously for the first time because I thought it would provide me with the right mix of theory and practice. I went into law school with a really laser focus on human rights, and I stuck with it. It was really helpful to have such a unified focus during law school. While you were at law school, what did you do to bolster your interests? At UofT it can sometimes appear that there isn’t a wealth of opportunity for those interested in social justice. But when looking around, there are definitely options. I worked at Downtown Legal Services [“DLS,” UofT Law’s poverty law clinic] over the summer and in the full-time intensive course after that—I basically did full time at DLS for 8 months and it was one of the best things I did in law school and in life. I also worked with the IHRP on a special project looking at Canada’s policies around Syrian refugees and HIV/AIDS. That project took a year and a half in total, so it was a long haul. I also kept up with my previous work, and writing on the side, to make sure that the all-encompassing law school experience was balanced by real life concerns. Were there opportunities outside of the law school? Yes, I kept up as much community work as I could and some on the more academic side. I was working on various projects on the side. While you were at UofT, did you ever think about diverting or changing your career path or were you pretty focused on migration-related work? There was maybe a second during 1L when I thought, “maybe I should be considering other things?” But I knew exactly what I wanted. However, I did try to push myself. I wanted to try and see if litigation was for me—it certainly was not. Family law was something that I tried to develop some skills in, and I ended up articling at the Schlifer Clinic [the Barbra Schlifer Commemorative Clinic offers legal representation, professional counselling, and interpretation services to women who have experienced abuse] that focuses on family and immigration law. Other than that, I would do a lot of one-off things—the client counselling competition or short snap trial advocacy workshops, just to get a well-rounded sense of what practicing law is all about. Any courses that you would suggest for students who are interested in social justice? Because I came in with a Master’s and work experience, I wanted to get broad exposure to law as it related to the issues that I was working on. But I definitely didn’t take many Bar Prep courses [also known as Black Letter Law classes]. It’s a miracle I passed the Bar! I took a lot of international law classes, with really interesting discussions and critiques of the law. For someone who is starting out and may not have an idea of what they want to do as a lawyer, taking foundational and practical courses is a good idea, like Trial Advocacy, or DLS, or the IHRP clinic course. Get a broad exposure and challenge yourself to think about the law - and your role as a lawyer - critically. Are there are areas which you’ve been surprised how much you use? There are certain classes which you might think are irrelevant, but later turn out to be very useful to your practice. For example, Legal Process and Professionalism and Ethics were super useful, because as someone with limited exposure to the legal profession, I needed to learn how the legal system worked broadly and fit together. Walk us through your path after law school. During law school, I worked in the Middle East doing a project for the IHRP, on a grant from an AIDS foundation. I worked there part-time during my 2L and 3L years, and full time in the summer during 2L. For articling, I applied to five organizations focusing on social justice. I landed a position with the Barbra Schlifer Clinic. What were your five articling applications? The Canadian Civil Liberties Association, the British Columbia Civil Liberties Association, Amnesty International, the Schlifer Clinic, and the Canadian Centre for International Justice in Ottawa. I also was in talks with a couple of immigration firms. But I wasn’t sure if a firm was the best fit. My articles were funded through the Public Interest Articling Fellowships from the Law Foundation of Ontario. The fellowship pays at roughly similar rates as firms. They also give you an amazing continuing education package—$5,000 to spend on learning. A nerd’s dream! I was so excited about this and went to as many conferences and continuing education seminars as I could. The Law Foundation of Ontario sponsors seven or eight organizations you can work with. The positions are pretty competitive as each organization only hires one person. Also, a downside as the only articling student is that you don’t have a peer group to bounce ideas off and for support. But these fellowships are such a great opportunity if you are interested in practicing human rights and social justice law. How did you find out about these opportunities? Mostly through personal research. I did talk to the CDO about working internationally, or splitting my articles between national and international. However, it takes a substantial amount of personal research, lots of networking, and connecting with people at organizations where you want to work to land the right position for you. Do you know of any other useful resources? The IHRP has a handbook about public interest and international human rights law careers generally, with an articling section in the handbook. There are also a couple of different fellowships which you can do. But if you are thinking about international articles, it is important to make sure that the lawyer who is supervising you is still a current member of the Ontario Bar. You have to do your own due diligence as you don’t have that much institutional backing. A fellowship is a good middle ground as you have a salary, good support, and you can have a network with other fellows. Also, talk to people doing interesting things with their law degrees and how they got there. What did you do after articles? After articles I was offered a couple of staff lawyer positions. I decided to turn them down to find the right fit for me. I still continued to take roles as a research lawyer at the Schlifer Clinic. Then a position at the IHRP came up! What was the job? How did you find out about it? I found the job online. The IHRP got a donation from the William C. Graham Foundation to employ a research fellow, to support the IHRP [and] to increase the consistency and the depth of the IHRP’s work. The IHRP now has a series of consecutive six months positions—it’s also a bridging program for [recent] grads who want to get into this field. I will admit that I was a little burned out from my time at the Schlifer Clinic—the Clinic handles very intense, very high-level trauma cases. I needed a break from that because my mental health was beginning to suffer. Talk about some of the projects that you worked at the beginning of your IHRP fellowship. When I first came on, we were going to do a research project on temporary foreign workers to document abuses on farms. However, from community consultations, we realized that the groups we were working with (mostly Filipino workers) wanted to explore litigation instead. So we followed their lead and pivoted to best serve their interests. Lawyers need to do a better job of working closely with communities. And it often pays off in unexpected ways. Through the connection to the Filipino community, the IHRP got asked to go on a fact-finding trip in the Philippines. Professor Anna Su and I went to Manila and Santa Cruz to learn about theimpacts of the drug war and what Canada could be doing in the region. I also worked on a case concerning the discrimination of Syrian drivers at the Ontario Human Rights Tribunal, and the intervention in the Vice media project at the Supreme Court of Canada [Vice Media Canada Inc., et al. v. Her Majesty the Queen in Right of Canada]. A new research area spontaneously presented itself. In January, the IHRP hosted a panel on the “Darker Side of Digital: Human Rights Implications of Technology in Canada and Abroad” and we became interested to see what was happening on the technology and immigration front. 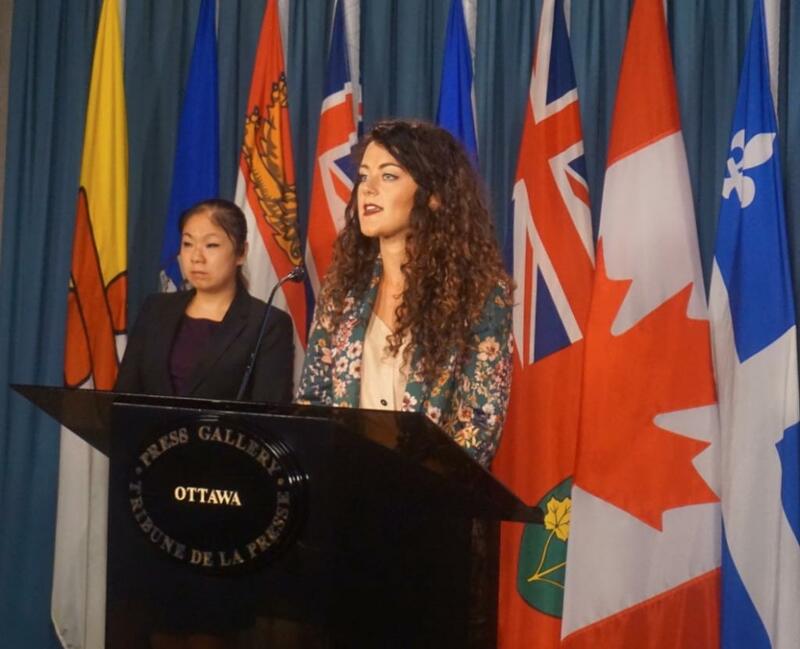 From there, we connected with Lex Gill [Citizen Lab Research Fellow and co-author of recent IHRP/Citizen Lab report “Bots at the Gate: A Human Rights Analysis of Automated Decision Making in Canada’s Immigration and Refugee System”]. This led to us to do a report on algorithms and automated decision-making, which was hugely taken up by the media and very well received – it’s been a bit overwhelming, but so wonderful to see such engagement. I am taking a flight to Cambridge! I’m going to be doing an LLM specializing in International Law. If you could give any tips to current UofT students interested in a career in International Human Rights, what would they be? You have to know yourself. Knowing who you are and what you want is key, because life is a series of choices. No career path is perfect, but you have to know what you’re okay with or not. Sometimes people say that you have to “pick your poison”: you can have a really stable career with a high earning potential, but you may not feel morally and ethically fulfilled. Or you can be super happy with the purpose behind your work, but you may have to do contract work that does not pay well and is unstable. Sometimes human rights work seems very glamorous, but it is also dangerous, exhausting, and uncertain (it also sometimes involves you googling “what is bankruptcy? !” in the middle of the night as you wonder if you will financially swing it). But at the end of the day, it is all worth it and I cannot imagine doing anything else. Being in tune with yourself, your motivations, and goals in life will really help make informed choices that feel authentic to you and where you want to go. At the end of the day, a law degree is an incredible privilege and responsibility. Use it wisely.